Equipment: satellite TV; iron/ironing board; combined heating/air conditioning (in the living room). Furnishing: friendly, well-kept, tiled floor, parquet floor. Please note: Owner lives on the ground floor. apartment, 2 - 4 people, 2 room/s, 1 bedroom/s, 1 bathroom/s, approx. 55 m², 1 floor/s, apartment on floor 1, sea view, access to the property via external stairs. Kitchen: Kitchen/ cooking equipment: 4 ceramic hobs, combination fridge-freezer, coffee machine, water boiler, toaster. open to the living room, exit to balcony. 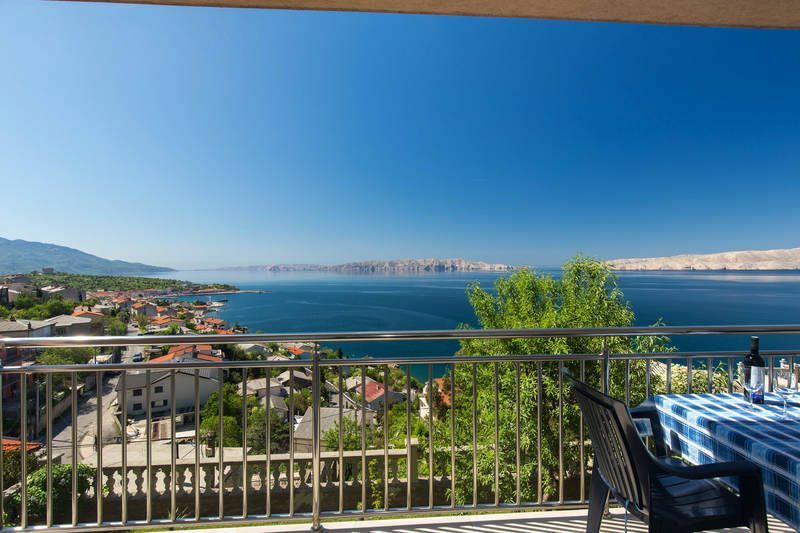 Situation: residential area, holiday village, hillside location, view of Krk, Rab. Plot description: balcony 10 m² (roofed), furnishing provided, sunshade. parking on the road near the house.